If you subscribe to the blogs you like via Bloglovin' you also find your feed bombarded with posts from Bloglovin' Fashion and Bloglovin' Lifestyle with titles like "How To Pull Off Pink Like a Fashion Blogger" and "How to Wear Ruffles Like a Minimalist". I ignore most of these, but the one I find most annoying is the "The 7 Best Fashion Blogger Outfits of last Week". As a 50-something blogger, I NEVER see anyone of my age demographic represented here. 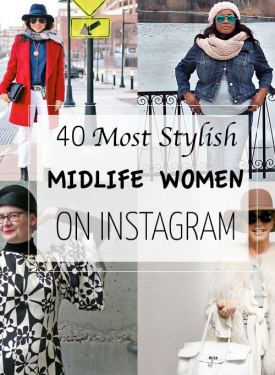 I have even commented on one of the posts to point out there are much more interestingly dressed bloggers over 40 out there, but to no avail. I assume the people who run Bloglovin' are most likely in their 20's and the blogs that get their attention are those authored by fresh young things who wear their designer duds with panache and the the right amount of insouciance. But seriously, with all the attention being given to older women via blogs like Advanced Style, and Iris Apfel, Joan Didion, and Joni Mitchell appearing in ad campaigns for designer clothing and bags, Bloglovin needs to get with the program. I realize the the word "Best" is in itself problematic - what criteria is being used to decide whose outfit is worthy of being included in a list of the "Best of"? When I see outfits I love on other bloggers, words like "Creative", "Inspirational", and "Visually Engaging" come to mind. So I decided to do my own list (because we know the way to get things done right is to do it yourself). I chose outfits that had been posted on blogs I follow this month, and I acknowledge there are countless other bloggers over 40 out there who are beautifully dressed but I don't have the time to follow them all. I can't help it if my friends are some of the most creatively-dressed and exuberant dames on the Internet. The women below are not wearing expensive designer clothing (or if they are, they bought it secondhand), but they show a style and creativity in their outfits and accessories that comes from years of trial and error to discover what makes them feel confident in their own skin. The outfits below say something about the people wearing them, and whether you like what they are saying or not, surely you will agree that they are not boring. This isn't to say that there aren't young bloggers out there who wear eclectic, imaginative outfits, but they aren't getting the attention they should, and neither are the women featured below. Yep, that's my pal Mel, from Vancouver. 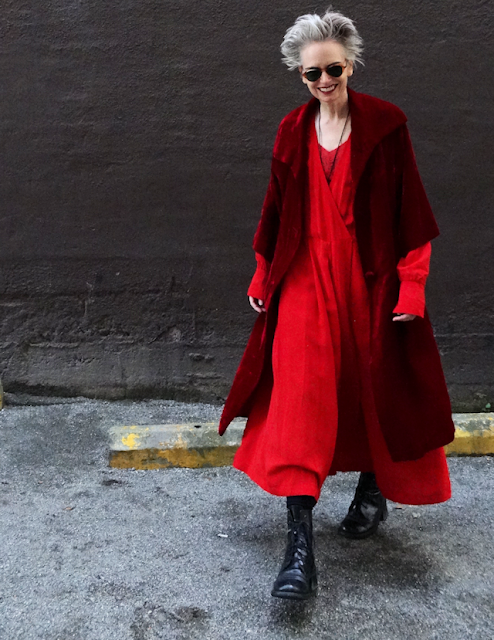 She has some serious style-balls, that woman. 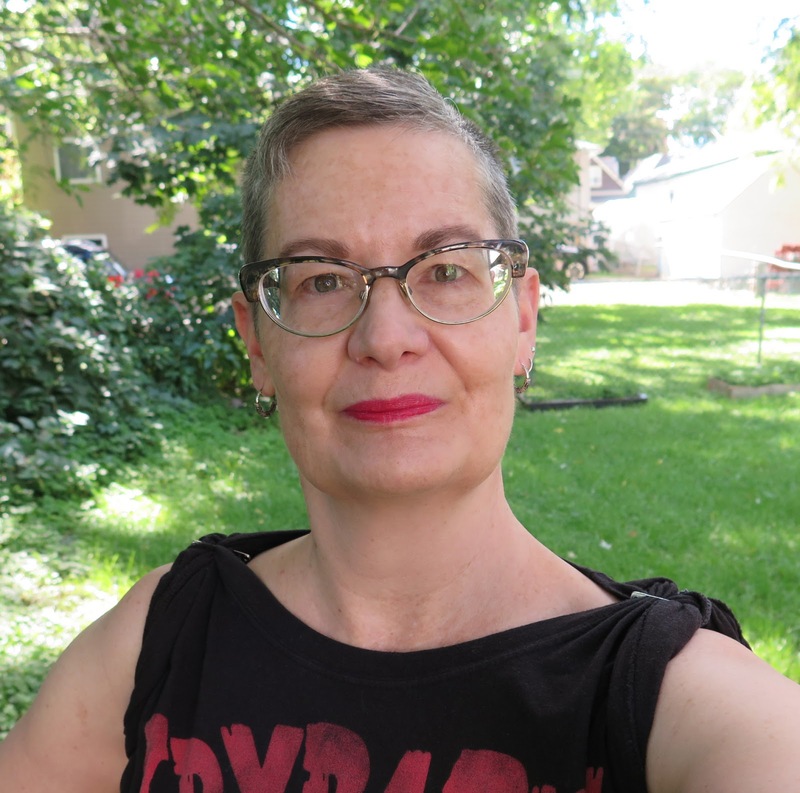 An avid thrift-shopper, she can figure out a way to wear absolutely anything, and make it look like a million bucks, and she is a talented artist with a a twisted sense of humour. Of course, all this makes her a Star in my book. Suzanne is also a regular thrift shopper (so much so that she is selling stuff on Etsy). She's a talented graphic designer who loves pugs (that's Zoe in the bottom left of the photo), and she has a wicked sense of humour which makes her posts a delight to read. Her gorgeous hair colour means she looks freaking awesome in the colour green. Judith, aka The Style Crone, is consistently one of the most eleganty dressed women I know. She is never without a hat, and not just any hat, but THE PERFECT hat for every outfit. She writes eloquently about ageing in a way that makes you feel inspired and look forward to the years to come. Pao's blog, Project Minima, is a showcase for her stellar sewing skills and excellent eye for shape and pattern. She alters patterns to suit her mood and has the best collection of funky shoes, most from Ebay, I've ever seen. 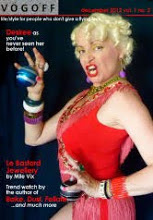 I've followed Vix's blog for many years, and she never ceases to entertain me with her colourful thrifted and handmade 1970's inspired wardrobe and tales of her adventures as a roving vintage seller. She and her partner Jon are on the road selling at Vintage Fairs in England all summer, and she still finds time to whip up a ruffled, off-the-shoulder top from a sari, or a maxi skirt from a tablecloth. I've had the pleasure of knowing these two stylish dames (Jean on the left, Valerie on the right) for about 5 years now, and I look forward to reading about their adventures in fashion, art, and cocktails every week on their blog, The Idiosyncratic Fashionistas. They hang out with the coolest people, have spectacular hat collections, and speaking from personal experience, they know how to show a visitor from out of town a great time. They are definitely the poster girls for "Growing Old With Verve". Sheila, whose blog, Ephemera, is a showcase for her eclectic wardrobe and jaw-dropping collection of Fluevogs, is also a fellow Canadian. She makes office wear fun with the pieces she finds in local consignment and thrift stores, and her husband, L, who also loves Fluevog shoes, is a very stylish guy in his own right. Along with great outfits, you can find photos of their mischievous cat companion, Vizzini on her blog. 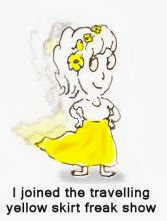 Desiree disappeared from the blogging world for a while and has recently returned, better than ever. 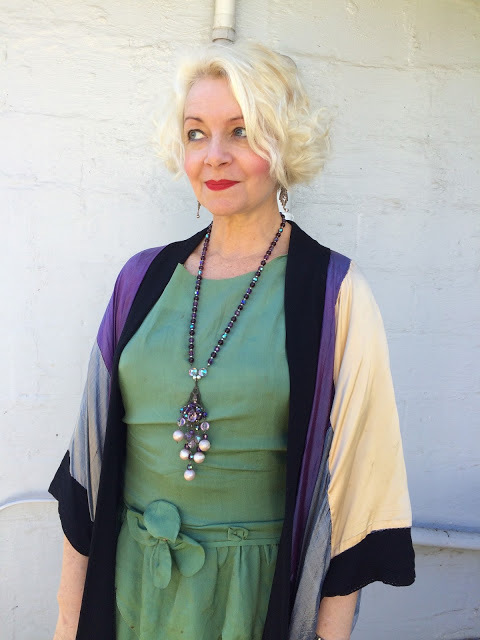 She's an outspoken Aussie whose outfits often incorporate at least one piece of vintage lingerie as outer-wear, and we share a love of the series, Miss Fisher's Murder Mysteries and it's delightful main character, Miss Phryne Fisher, who inspired her outfit in the photo above. I am pleased (and surprised) to see that Bloglovin' saw this post, and featured it in their weekly roundup post of "inspiring stories" last night. Thanks to Mel for the heads up. Maybe there's hope for you yet, Bloglovin'! There are many losses you find yourself dealing with as you age. There are life-altering ones such as the loss of loved ones, jobs, and good health. There are losses that affect how your body looks - loss of muscle tone, smooth skin, a flat stomach, hair pigment, etc. which can affect your confidence and self-esteem. We think we are prepared for these inevitabilities - after all, they happen to everyone eventually, although their approach can be slowed by exercise, diet, surgery, and hair colour. One loss I was not prepared for was the gradual, but noticeable disappearance of my eyebrows. It seems a minor thing when compared to all of the possible things I could lose, but it bothered me nonetheless. This is the face you're used to seeing on my blog. I've grown accustomed to it, and on most days, I think it's a rather nice face, but it took years for me to accept I was never going to have the full lips or perfect nose the girls in the fashion magazines had. I try to make the best of what I have, and never leave the house without lipstick. Recently, one of the bloggers I follow, Greetje, of No Fear of Fashion, did what I thought was a very gutsy post on her blog where she showed the "Before and After" face of a woman over 60. I'm not that brave, but I can show you a before and after eyebrow shot. Yep, there we are, thinning brows and minimal eyelashes. I would love to wear mascara, but I have a very annoying and occasionally painful condition called recurring corneal erosion, and I try to avoid eye makeup on a daily basis. From the looks of that sun damage on my skin, I did not use enough sunscreen this summer. 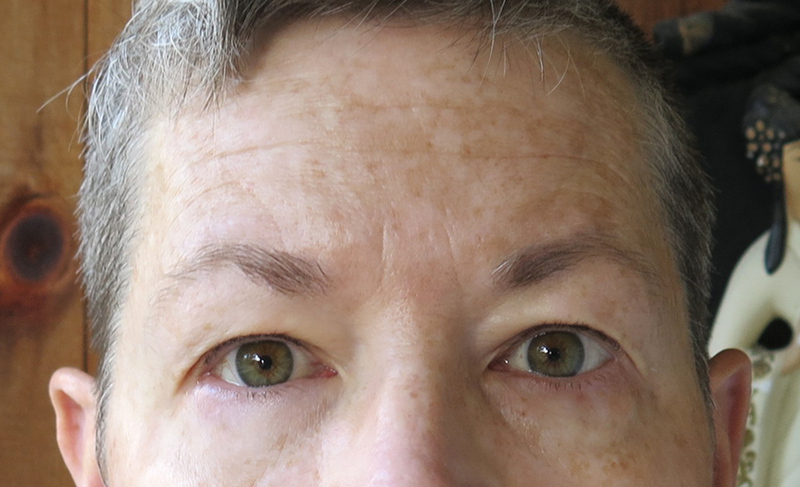 Fortunately, disappearing eyebrows are easier to deal with than many of the other losses I mentioned. For a few years I had been using another product made by Benefit called "Gimme Brow" which is basically a mascara for your eyebrows. It looks natural and stays on pretty well, but I found it faded by the end of the day. 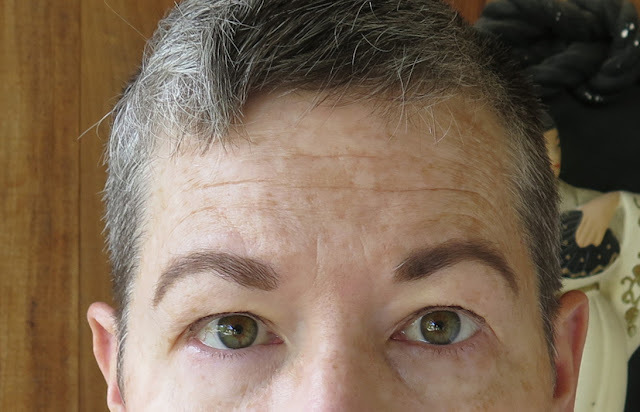 I wanted to try something that would give me some major brows that looked natural and lasted all day, so I chatted up one of the staff at my local Sephora. She suggested a new Benefit product called "KA-BROW! ", which is a cream-gel brow colour that comes with its own brush. It comes in six shades, and I picked #4, which was a bit darker than what I was used to. It takes a bit of practice to perfect the light touch that is needed so you don't end up with too much colour - you can always add more, but once it's on there, it doesn't come off unless you wash it off and start over. KA-BROW! You can see that my left brow is a bit darker than the right, but as I said, it takes a bit of practice to get it right. Not bad, eh? BTW, I am not affiliated with Benefit, and am not being compensated in any way for this post. I just like their brow products and I figure if they work for me, they may work for you. I'm not a makeup junkie - my daily routine consists of a bit of foundation, brow colour, and lipstick. 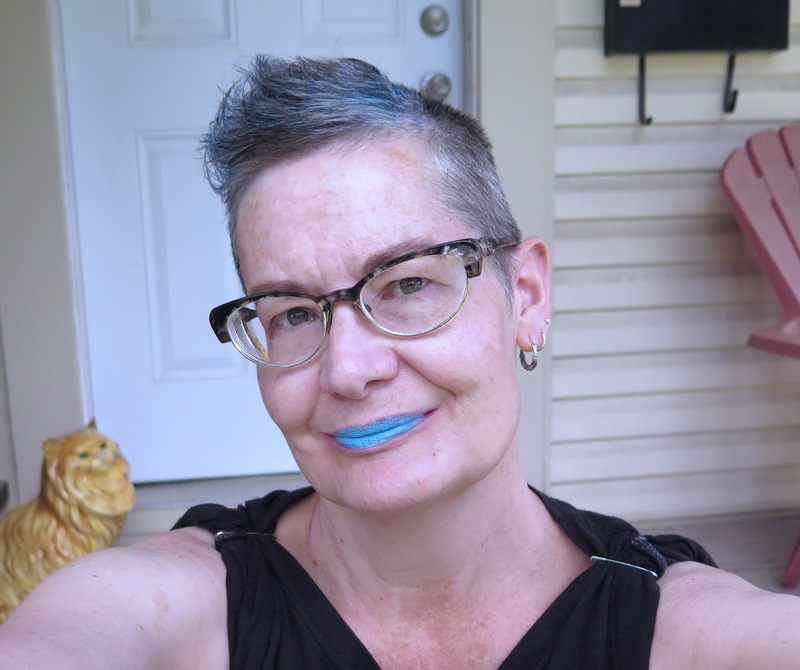 However, I do like experimenting with lipstick colours, and after the photoshoot I did with Melanie when I was in Vancouver in May, I fell in love with blue lipstick. A second trip to Sephora and I came home with this creamy blue lipstick from Make Up For Ever. I put a bit of blue-tinted gel in my hair to amp up the Blue. Now if only I could wear this to work. 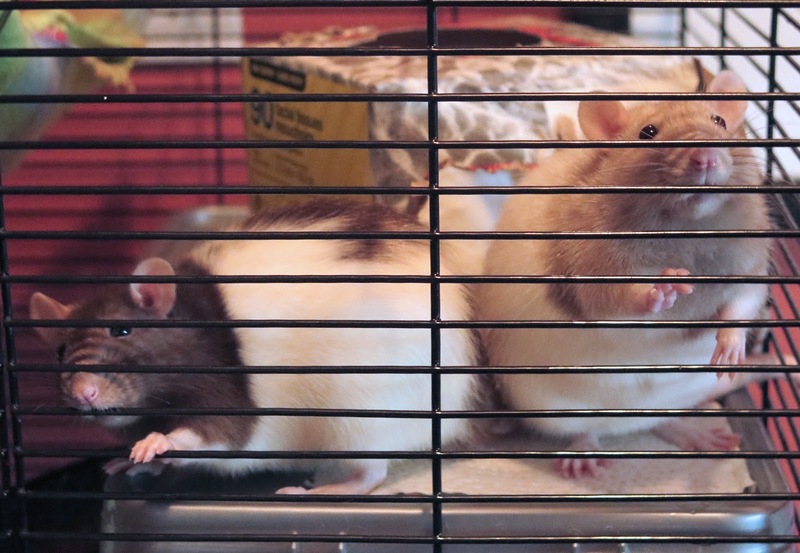 Those of you who follow me on Instagram know that I have had my sweet little rat nuggets back with me for a few weeks, and I've been able to manage my allergies with regular use of my inhaler and not handling them as frequently. 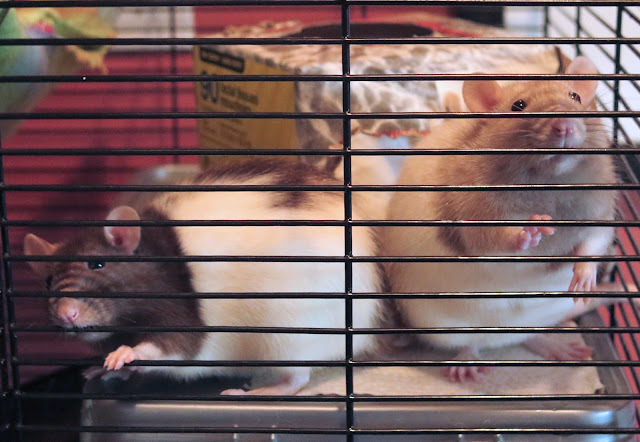 The three of us are much happier when they are with me, so I'm taking things day by day, and while I'm not expecting to be able to keep them with me continuously, we may be able to work out some kind of regular "respite" care where they stay with Heather for a few weeks at a time.